Striper fishing guide, Steve Barnes told Lone Star News that the colder air temperatures and subsequent colder water temperatures turn the fish on. In the winter he likes to used artificial over live shad. His favorite striper fishing technique is dead-sticking a soft plastic fluke-type lure on a 1-ounce jig head, holding it still and allowing the slow drift of the boat to move the lure. White, silver and chartreuse work best for him and his clients because the fish see contrast in color better than baits that are one color. If he uses a chartreuse jig head he will use a light-colored fluke. If he has a white jig head, then he uses chartreuse fluke. He drifts areas where fish have been feeding. He gets their attention by using a guide fishing trick of splashing the water or beating on the side of the boat. Eddie Parks of Sparky’s Guide Service explains that any time the water is cooling down, you'll catch a lot more, bigger fish. He says the fish will be in deeper water feeding and fattening up on shad. At Possum Kingdom Lake, Guide Randy Wood said dead-sticking is working for stripers, with some good blue catfish mixed in. If the birds are working, and there are plenty of fish but they are moving fast, chasing the bait up to the top, he switches to swimbaits. 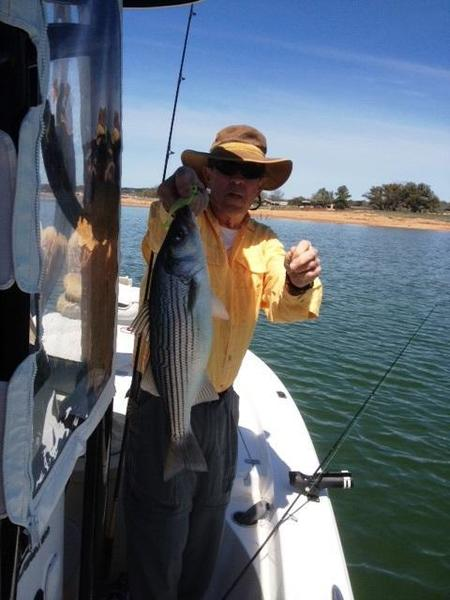 All the guides say the striper action will continue to February on both Texoma and Possum Kingdom.